Shark Day! Readers looking for a blood-curdling account of our dive with sharks this morning will need to look elsewhere. Rather, the experience was more like entering a quiet sanctuary, some fifty plus feet underneath the water's surface a few miles offshore from Bimini at a small reef called Bull Run. After a short briefing from Captain John about the strategy for the dive, we donned our wet suits and tanks for the descent. What had taken me 15 minutes earlier in the week, was now happily down to about 5 minutes. We waited on the Coral Reef's dive platform until everyone was ready to head down together. Then we quietly descended, swimming with the current (which made for an interesting swim back). We slowly came upon the reef and then huddled down on the bottom to wait. Within a few minutes, a solitary reef shark (Carcharhinus perezi shown at right) maybe 6 to 7 feet long came ambling by a few yards away, pretty ambivalent to our presence. With his silver gray undersides and black tipped fins, he was a pretty imposing figure. Ever feel helpless looking at something that is doing what you're doing a whole lot better? That was the feeling I had as I again checked my air, realized I had to get moving back to the surface within 10 to 15 minutes, and felt thankful that the second shark swimming overhead seemed as totally disinterested as the first. Sharks are the top predator of the oceans. Some say they have become increasingly scarce in the Bahamas; others say a decline isn't that clear. Capt. John, who has been leading collecting trips and research expeditions in the Caribbean for more than 25 years, doesn't think there has been much change. Capt. Lou, our other skipper, actually thinks he's seen more in recent years. John has seen the Taiwanese shark-finning in the area, though, a practice that is wasteful at best, repulsive at worst. Clearly, I'll need to do some research when we get back to Boston. 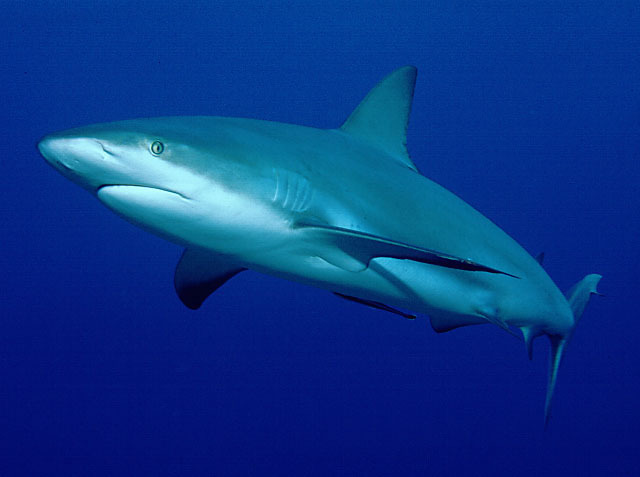 There are about nine species of Requiem sharks in the Caribbean, of which the black-tipped reef shark is one. Most are not considered dangerous to humans, provided they are not provoked. Some dive boats use chum to entice the sharks into their groups of divers, a practice that neither the Aquarium nor the Captains of the Coral Reef II advocate, because arms and legs can easily get confused with chunks of fish bait and because the technique just doesn't seem very organic. In any event, we ascended slowly against the current back to the Coral Reef II, something that was a bit more challenging than I anticipated. (Fortunately, an astute safety observer on the boat lengthened the floating safety line, which soon came rapidly drifting my way.) Other divers in the group reported seeing several more sharks while they were down. Personally, I was happy to have seen only one or two and I felt fortunate to have experienced them respectfully on their own turf!